As Al and I jogged along Azaibah beach in the early morning, I pointed out a group of turtles that have been returning to this spot for the last three weeks. Mrs M had business at the Intercon hotel this morning where, it would seem, Christmas is already rearing its ugly head. 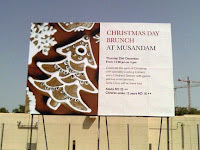 Several senior dignitaries from the Women’s Guild were wearing Father Christmas hats and the hotel’s car park is sporting a large advertisement for Christmas brunch, enticing us to ‘celebrate the spirit of Christmas’. It’s just wrong. We took a 'spot of lunch'* in the Tomato café; two salads and a curious minestrone soup which resembled tinned fruit served in a stained glass widow. The chaps went to the Shafaq pool for the afternoon while I tinkered with a few ingredients to create something Swedish from the IKEA cookery book. This was consumed in the clammy heat of the evening, followed by one of Mrs M's extraordinarily rich chocolate pots. Lizzi's flight, re-routed via Istanbul, eventually arrived after midnight. Mrs M Tours will commence at 9.30 a.m. Sharp. *A phrase new to Al, Lizzi would later reveal.